What are Tribal Youth Ambassadors? 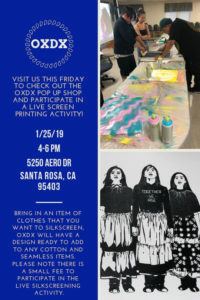 Visit us this Friday to check out the OXDX pop up shop and participate in a live screen printing activity!! Bring in an item of clothing that you want to silkscreen, OXDX will have a design ready to add to any cotton and seamless items. Attendance is free but there is a small fee to participate ($10 per print). The California Indian Museum and Cultural Center was founded in 1996 with the purpose of educating the public about the history, culture, and contemporary life of California Indians and to honor their contributions to civilization. © Copyright 2019, All Rights Reserved CIMCC.